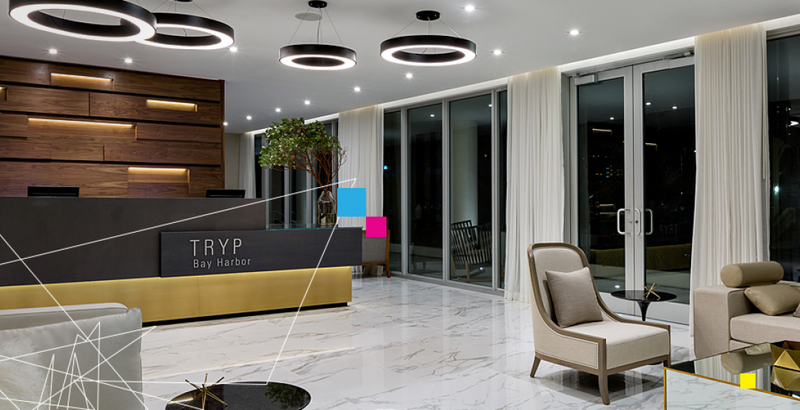 A sparkling Miami newcomer styled for trend-setters and sophisticates, TRYP by Wyndham Miami Bay Harbor pairs city-centric experiences with a low-key vibe. From modern guest rooms and suites to a rooftop pool terrace with skyline views, this Bay Harbor beauty makes it irresistibly easy to mix beach time with business. We are minutes from Miami's world-renowned dining and nightlife scene. We offer easy access to trendy Wynwood, Brickell, and Coconut Grove. Enjoy sweeping views of Miami Bay Harbor's Intracoastal just outside our door. We are within walking distance of Bal Harbour Shops' designer boutiques. We're just minutes from Bal Harbour and Surfside beaches. Indulge in Miami's eclectic breakfast scene with this special offer. Y wait to impress your tastebuds? Plan ahead to lock in a great low rate and score 200 Wyndham Rewards bonus points. Just one more reason it pays to call the Sunshine State home. Simply book and show valid Florida ID at check-in. This was definitely one of the BEST hotels I've ever stayed in. The hotel staff there were exceptional. I really loved my room, and the balcony view of the harbor. The hotel was beautifully designed and decorated inside and out. I loved the rooftop pool and hot tub as well. They even allowed us to stay an extra two hours after our original check out time. I would definitely stay here again! Very modern rooms and the highlight is the roof top pool with amazing views of Bay Harbor and walking distance to restaurants and shopping. We were welcomed by Dana who was very friendly and went over above her duties, to make sure we had a comfortable stay.